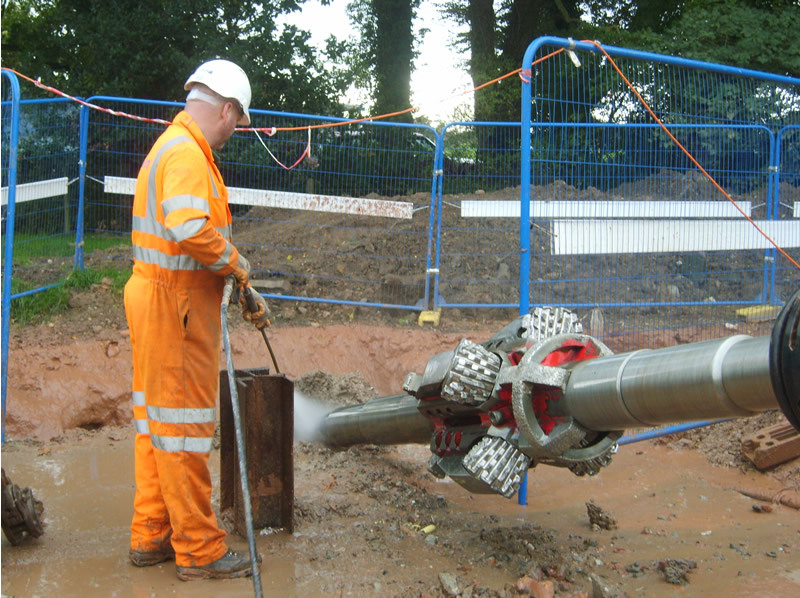 Commissioned by United Utilities, the aim of the scheme was to lay a new potable water main from Franklaw water treatment works (WTW) to Hoghton reservoir as part of large diameter pipe cleaning enabling works. In total 6km of pipe had to be installed between the WTW and the reservoir by a combination of open cut and horizontal directional drilling (HDD), with HDD used to negotiate two areas of engineering difficulty. Balfour Beatty Utility Solutions Ltd commissioned AMS No-Dig in 2008 following a competitive tender process. The project involved horizontal directional drilling under the River Wyre, The Avenue and a farm access road installing a 630mm HPPE water main. The length of the crossing from entry to exit point was originally 270m. In addition a further 150m of 630mm HHPE was drilled under a factory forecourt. The succession of the sub strata consisted of alluvial deposits of sand, gravel and cobbles down to 12m, with strong bunter sandstone lying below. AMS No-Dig’s engineers had initial concerns with the interface between the superficial layer and the rock layer and how the pilot drill would react once this change in formation was reached. Under certain conditions the pilot drill can have a tendency to slide along the top of the rock strata losing build to a point where the rock cannot be penetrated. The reverse situation can be experienced on the exit side. To enable an informed decision to be made as how to proceed, AMS No-Dig commissioned a geotechnical company to undertake further ground investigation along the route to confirm the depth and angle of the rock at both the entry and exit sides of the drill. The results of these investigations were then plotted on the long section drawing giving a clear indication of how the rock strata were lying. After consultation it was decided to alter the original bore plan to ensure the pilot drill met the rock at a much more severe angle than originally planned. The effect of this decision increased the length of the shot by 50m and the bottom of the hole would be at 24m as opposed to 18m. The pilot drill commenced on 4th September 2008 using a 6 3/4″ Mud Motor fitted with a 9 7/8″ TCI sealed bearing tri-cone drill bit. After drilling for one hour the interface was reached, at this point the mud motor was turned low side and drilling progressed with careful monitoring of the drilling angle. Once it became clear that the pilot drill had entered the rock formation the pilot was retracted 12m and was then sent back in to the face rotating the drill stem as it progressed. When the face was reached the pilot was turned back to high side and the pilot drilling recommenced on the bore profile. Rate of penetration (ROP) proved to be quite good at 24m per hr which dropped to 15m per hr at depth. The pilot drill punched out on 6th September and showed a moderate amount of wear. 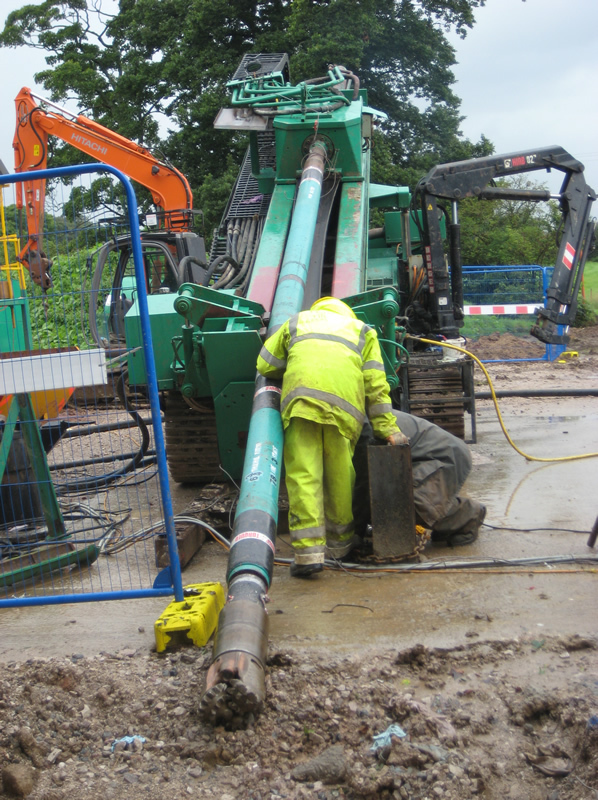 Enlargement of the drilled hole to the required 36″ was carried out over a 4 week period using R type hole openers supplied by Slimdril International. An R17 body was used with interchangeable arms to open the hole in two stages to 26″ followed by an R26 body cutting in two stages to 36″. A final cleaning run was then carried out which removed a further 10 cubic metres of material. In total 160 cubic metres of solid material was removed form the hole before it was decided to pull the pipe. The pipeline was connected to a fly cutter followed by a barrel reamer and the pipe string was positioned on low friction conveyors situated at 10m intervals. 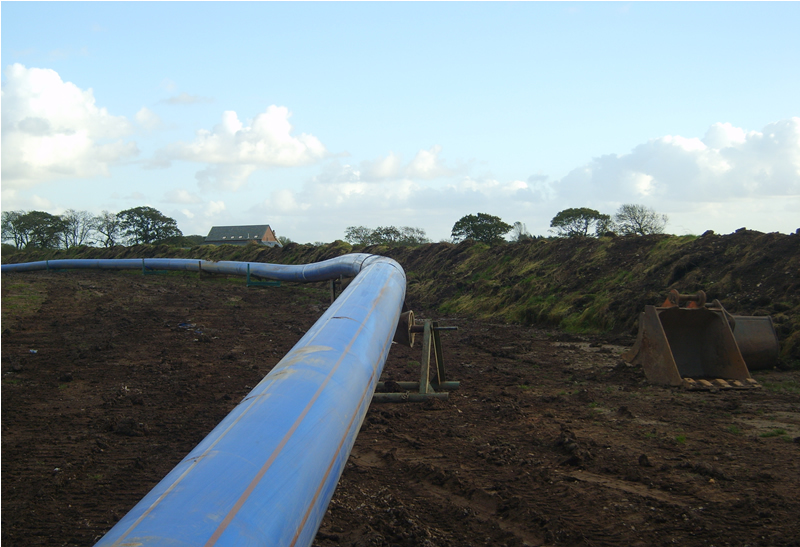 Pipe pulling commenced on 20th October at around 10am with the installation completed some 5 hrs later at 3pm. Initially pull back load was at 17 tonnes peaking at 27 tonnes at hole bottom dropping to 20 tonnes on exit which proved that a good clean hole existed. Ballasting of the pipe with water was considered but due to possible contamination of the pipe it was deemed as unnecessary when considering the relatively short length of the pull. 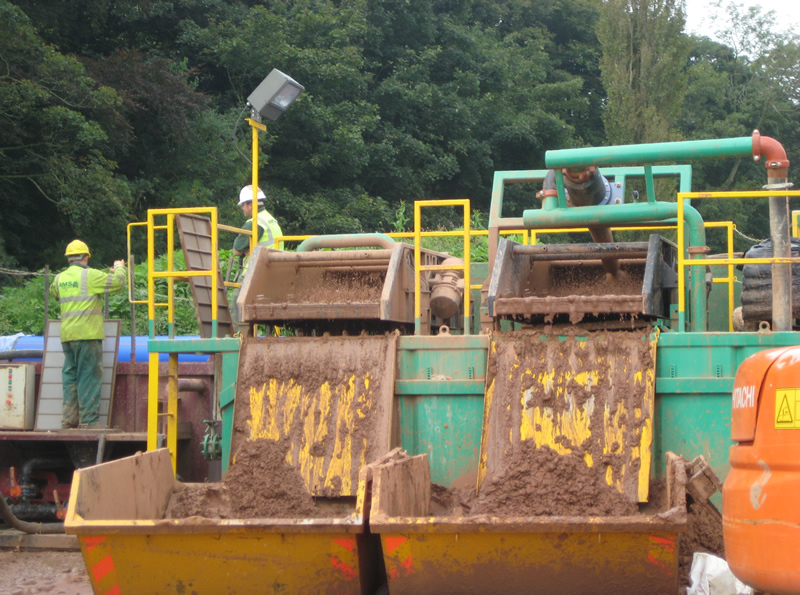 Mud management and solids separation was carried out using an LCC 500 system which cut solids to 60 micron supported by a 152 Centrifuge for final mud cleaning down to 10 micron. Transfer of mud from the exit lagoon to the mud processing system was carried out using a partial below ground mud return line using 125mm mdpe pipe, with the mud being pumped by a succession of 6″ Seltorque pumps.